Ah, German wine labels; uniquely intimidating. The key to this one, though, is “trocken,” or dry. For a region associated in the Australian mind with sweet Rieslings, the Mosel churns out a fair few dry versions of its signature variety and I’m especially keen, while working here, to taste as many as I can. 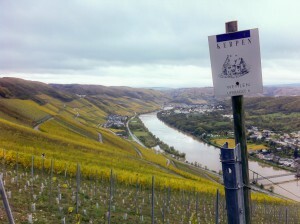 My vintage hosts in the Mosel are the kind folks at Weingut Kerpen (a disclaimer in addition to a hopefully-interesting factoid). Martin Kerpen, the proprietor, excitedly called me over after a tasting this evening and shared this particular wine with me. A bottle from his private cellar, this shows the benefit of its glass stopper and cool conditions; it’s in exceptional condition. And what a lovely wine too. I keep coming back to the word “pretty” when tasting this. It has a delicate charisma running right through its refined body, and this plays out through its flavours, which are bright and delicate, and its structure, which is firm and fine. Only the first signs of toasty development are evident on the aroma, which is composed primarily of citrus blossom, talc and a hint of cumquat juice. Absolutely no kerosene here. The palate is intensely flavoured within the confines of a fundamentally delicate wine. The acid is spectacular in its finesse and balance. A hint of sweetness fills out the juicy mid-palate, but the wine finishes dry and its flavours don’t read as overtly sweet. I suspect this will develop for several years yet, and I envy those with a few bottles in their cellar. I chilled this wine in preparation for last night’s salmon dinner, but we didn’t get around to drinking it. So it came out tonight instead, was asked to partner chicken, and did so with aplomb. It had to blow off a fair bit of sulfur first, mind you. Quite prickly and stinky for a few minutes, leading to a much cleaner, rather candied expression of yellow fruits and citrus, along with a hint of cheese. There’s a nice streak of savouriness too, minerality I guess, that cuts through the rich fruit aromas. It’s not exactly slick; rather, it’s a dressed up country cousin of a wine — attractive and neat, but roundly wholesome too. Great presence in the mouth. Entry is quite tingly and full-flavoured, leading to a middle palate of significant proportions and generous intensity. There’s a degree of formlessness to the fruit flavours, which detracts a little from the precision of other components like the firmish acidity and mineral edginess. A chalky mouthfeel tightens the after palate, cleaning up a slight excess of sweetness and laziness of form, before a nice long finish fades slowly on the tongue. Not bad at all, then. I like the interplay of sweet, almost crackly fruit with adult savouriness and delicious texture. A touch more focus would make this even better.